JED KING’S LIFE has been shaped and scarred by the songs and mistakes of his famous father. He wants to sing his own song, but the words and melody are elusive. Jed’s dreams of a successful music career seem out of reach…until he meets Rose. Inspired by his love for the vineyard owner’s daughter, Jed pens a new song— a song with such emotional power and longing that it catapults him into stardom. But with this life of fame comes temptation, the same temptation that lured his father so many years ago and now threatens to unravel his marriage. 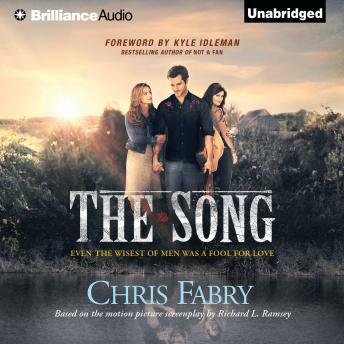 The pull of “The Song” takes Jed and Rose on a journey that will force them to deal with failure, the pain of loss, and the desire to be who God created them to be. Together they will test the limits of the promise that love is the power that heals. Lyrical and deeply honest, The Song asks hard questions of love and forgiveness. When even the wisest of men is a fool for love, can true love persevere?